When they left for Town Meeting Day recess nearly two weeks ago, members of the House Health Care Committee were debating whether to fund their policy priorities by taxing business payrolls or sugar-sweetened beverages. On Wednesday, they coalesced around a new plan to do both — and to eliminate an existing tax on businesses that don’t provide health insurance to employees. The hybrid revenue package, which won support from eight out of 10 members present for a straw vote, came together quickly Wednesday — and it could fall apart just as quickly. A formal vote is expected Thursday morning once the latest version of the bill is fully drafted. "To be honest, until lunchtime I didn't have a proposal to put on the table," Chairman Bill Lippert (D-Hinesburg) said as he unveiled the package later that afternoon in a jam-packed committee room. Lippert readily admitted that the fate of his revenue plan, like nearly every money-related matter before the legislature, remained in flux as the deadline to take action approached. Even as his panel neared a vote Wednesday, the House Ways and Means Committee was engaged in its own debate over the highly controversial sugar-sweetened beverage tax. The latter committee, which will draft the House’s final tax bill, is seen as less likely to sign off on it. "I'm under no illusion this will be the last proposal,” Lippert said. “I am supportive of that framework,” Smith said. House members, legislative staff and administration officials discuss the health care bill in the Statehouse cafeteria Wednesday afternoon. Though the debate over how to fund the bill sucked up much of the oxygen in committee Wednesday, Lippert implored his colleagues to focus on the policy changes at the heart of the roughly $70 million legislation. Chief among them is Gov. Peter Shumlin's proposal to increase reimbursement rates to medical providers who treat Medicaid patients. Doing so, proponents argue, would help reduce a so-called "cost-shift" that has contributed to the rising cost of private health insurance. 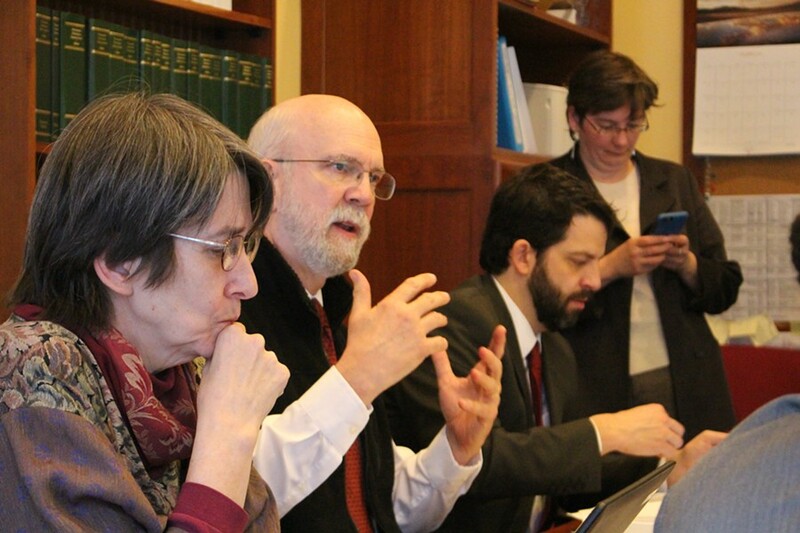 The bill would also invest in cost-sharing subsidies to low-income Vermonters who purchase insurance through the state's health exchange. 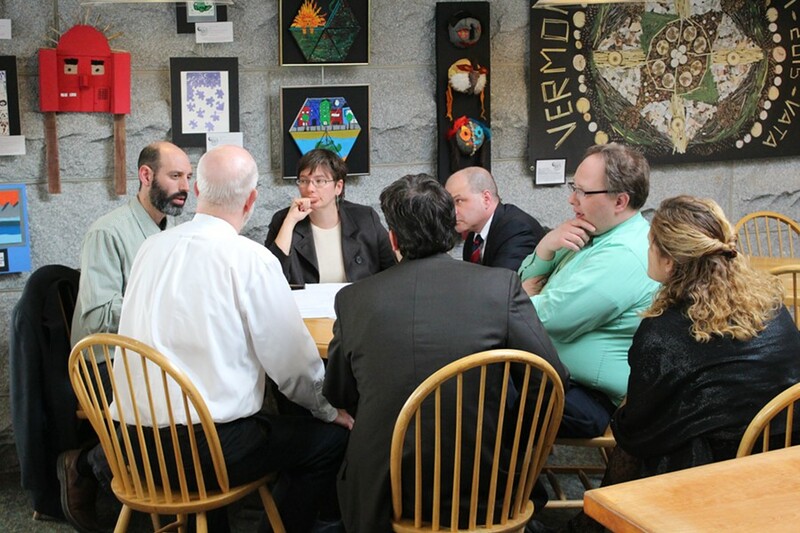 It would increase funding for the Green Mountain Care Board and Blueprint for Health, and it would fund two new studies to explore the feasibility of reducing the number of uninsured Vermonters and providing universal primary care. “The priorities were to increase access to health care and increase access to insurance,” Lippert said. In his budget address two months ago, Shumlin called on the legislature to levy a new 0.7 percent payroll tax to address the cost-shift, finance new Medicaid enrollees and support other health care priorities. But members of the business community balked, questioning whether the new tax burden would actually result in a slower growth in premiums. The plan appeared to be on life support until Tuesday, when the governor’s chief of health care reform, Lawrence Miller, presented a revised proposal to the House Health Care Committee. He told its members they could address the cost-shift exclusively by imposing a payroll tax of just 0.35 percent. He also suggested doing away with the so-called “employer assessment,” which penalizes businesses to the tune of $500 a year for each uncovered employee. The committee took both suggestions to heart, approving a 0.3 percent payroll tax and eliminating the employer assessment. In order to finance its other priorities — such as increasing cost-sharing subsidies for those buying insurance on the exchange — it also adopted the two-cents-per-ounce tax on sugary beverages. 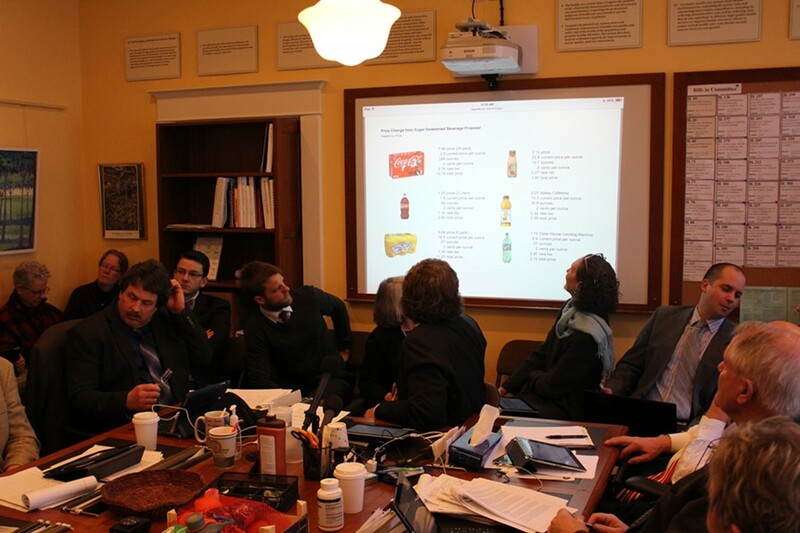 House Health Care Committee members view a comparison of sugary drink costs. Rep. Paul Poirer (I-Barre City), who had initially opposed the payroll tax and supported the sugar-sweetened beverage tax, said he found the plan to be a reasonable compromise. Not everybody on the panel agreed. Reps. Anne Donahue (R-Northfield) and Bob Bancroft (R-Westford) indicated they would oppose the package Thursday, calling it too expensive. Rep. Tim Briglin (D-Thetford) said he opposed elements of the tax package — including the sugar tax — but would back the underlying bill. “I’m wondering if this is unfairly targeting people with lower incomes,” he said. Poirer, who chaired the committee when it first levied taxes on cigarettes in the 1990s, said his experience with tobacco taxes led him to the opposite conclusion. Similar arguments played out Wednesday in the Ways and Means Committee. "There is absolutely nothing in soda that's good for you," said Dr. Barbara Frankowski, a University of Vermont pediatrics professor. "If you take away sugar-sweetened beverages you can help children lose weight." Others argued such a tax would kill off small country stores unable to compete with larger chains, which can more easily absorb price increases. "If you want to see Vermont have Dollar General and Walmart for options ... then you can have Dollar General, because you won't have stores like ours, because we can't compete," Pam Trag, owner of Quality Market in Barre, told the committee. But Shumlin’s staff worked with Lippert throughout the day to fine-tune his proposal — and the governor himself appeared unwilling to rule it out entirely. He said at a press conference that he would not “micromanage” the legislative process. Lobby Hobby: Who's Spending Big on Vermont's Legislative Session?